What are the factors that affect property tax? How to pay property tax? Where to pay property tax? When you are investing in real estate, there are many taxes and duties potential homeowners are obliged to consider before they take the leap. 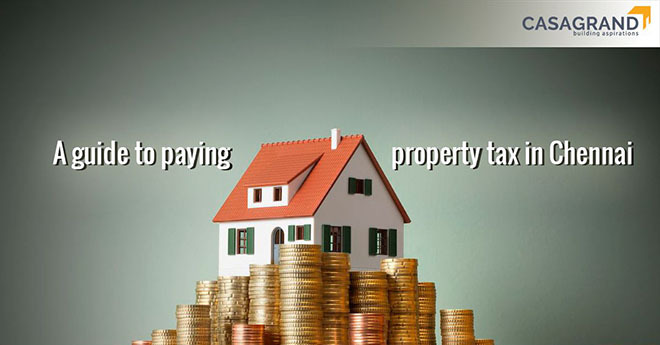 However, once the deal is finalised and you have been transformed into a proud property owner, there is a recurring tax amount which needs to be paid to the government of India – and that is the Property tax. Just like any tax structure, the property tax payable against residential and commercial properties varies from state to state. When it comes to the urban city of Chennai, property owners are obliged to pay their property tax to the Greater Chennai Corporation (GCC). Let’s take a look at the factors that make up the property tax structure of Chennai and the whereabouts of paying it regularly. In order to calculate the property tax of a building, the GCC follows the method of Reasonable Letting Value (RLV). In this method, the annual rental value of the property is calculated based on a few fixed factors and then divided accordingly to come up with a half-yearly sum. Total built-up area of the building: This includes the square feet area, the walls, corridors and other common regions used by the residents like the lobby and stairs. Basic rate of the location: This is a basic pre-determined rate based on the street in which the property is constructed. Type of occupancy: The property tax varies based on whether the owner is living in the property or has let it out for rent. Usage of the property: The tax also varies based on the whether the property is used commercially or residentially. When the building was constructed: The age of the building is one of the main factors that determine the amount of property tax to be paid. The most reliable and hassle-free method to calculate and pay your property tax is by logging into the GCC website and paying it online. In case you want to calculate the tax manually, you can visit the property tax guidelines on the website and precisely calculate how much tax you are eligible to pay. If you are having trouble calculating your taxes, or if the amount calculated manually does not tally with the computer-generated amount presented online, you can escalate your complaint to the revenue officer by reaching him/her at 044-25383614/25384510, with the extension 381. Though paying your tax online is the most convenient way, you can also manually pay your tax by visiting the respective zonal office at your location. Additionally, you can visit the office of the revenue officer or even drop in a cheque at any one of the leading banks in India. The banks eligible to accept the payment are HDFC Bank, Axis Bank, ICICI Bank and Canara Bank, to name a few. Property tax is collected on a half-yearly basis. The final dates to be paying the recurring amount of tax are on March 31st and September 31st every year. In case you missed paying your tax by the dates mentioned above, a late payment charge of 1 percent of the outstanding amount will be added every month after the final due date. The tax collected by the GCC, from the homeowners of the city, is used to fund basic municipal facilities like construction of roads, improving the infrastructure of the locality, building schools, and other such civic services. Chennai is blessed with the most user-friendly tax calculation system when compared to other metropolitan cities of India. The completely digitised taxation system makes use of cutting-edge web and information technology to ensure safe and secure transactions. Furthermore, the much-awaited real estate regulatory act and the recently implemented GST tax reform have created a huge positive impact on the real estate sector. With such extensive methods in place, it only makes sense for you to invest in real estate now and make your dream home a stunning reality! If you are planning to buy a house, make sure you check out our extensive blog on how to make sure the property you buy is legally clear and our detailed home safety and security guide for a hassle-free home buying experience. Visit Casagrand today and treat yourself and your family to luxurious living.